Sheep For Meat, Milk Or Wool In Your Own Farm Yard Even If You're Just Starting Out In Sheep Farming"
You've been searching around for information on how to raise sheep, but you not finding enough guidelines to get you started? Or you have some questions you need answers to when raising sheep? Well look no further because I've got the answers to all questions you may have to raising your own healthy sheep. Many years ago the sheep industry of America flourished. Then came a period of depression in this line accompanied by a steady decrease in the number of sheep kept. But the tide turned again about 1914 and the sheep are rapidly coming back to American farms and ranges. This change is doubtless due to the steadily increasing cost of grain and labor accompanied by correspondingly high prices of lamb, mutton and wool. Also to a general recognition of the economic value of sheep—both of the mutton and wool breeds—as quick producers of income, no little part of which should be profit. You too can grow big, healthy, profit-paying sheep, if you will merely meet certain clearly defined sheep requirements. If you do this, and it's easy, you need never worry about profits, you are sure to succeed. Raising sheep has moral, emotional, physical, environmental and economical benefits. All these have their own level of importance. Mutton which is meat produced by sheep is enjoyed by lots of people around the world making it an in-demand produce. So by raising sheep you position yourself into making residual income by producing mutton. Sheep milk contains nutrients that help in keeping a body healthy, some of the vitamins found in sheep milk is E,B and A which is very good human beings. The milk offers more nutrients than cow milk. The milk produced by sheep can also be frozen to produce quality cheese. A Single gallon of sheep milk can produce more cheese then that of cattle thus making you more money then cheese from cattle milk. Since sheep graze the grassland they help restore balance through their urine and manure deposition. In return the grassland grows green thus repaying the sheep by producing fresh plants for them to eat. You don't require intensive labour to raise sheep. If you are a farmer that may have other interest sheep won't require you to be taking care of them, they can graze the fields while you pursue other interests. Sheep are easy to manage since they don't require expensive housing and not reliance on expensive equipment for feeding. This is a huge advantage since you we save a lot of money in building expensive shelter and equipment. Mis-mothering rarely occurs with this kind of livestock since they make good parents. Just make sure they have enough space when lambing so they can be able to care for their young ones. You are able to generate earnings merely by raising lamb on your farm because of its fiscal value. This can be done as your principal revenue stream or a complementary profits generator for your some other farming businesses. Raising sheep can give you an advantage when paying taxes. So to all the profits you will be making your area holdings will likely be taxed in lower agricultural charges. When compared to other animals sheep are simpler to deal with and ideal to be a family pet. With this being said the elderly may uncover sheep boosting an enjoyable and advantageous activity. As you see there are lots of benefits as to why one would want to raise their own sheep. When done right sheep farming can be very rewarding and can bring some good profits as well. But it is very important that you know what you are doing when starting out because you can easily make costly mistakes. If you want simple, easy read information on raising sheep and enjoy all the benefits of owning sheep, all in one place, finally there's now a complete guide to successful sheep farming. Before you get started in raising sheep make sure you know what your purpose is to raising sheep. Knowing why you want to want to raise sheep for will help you in deciding the type of breed to choose. There are some breed of sheep that are right for milk production whilst others are good for meat and wool production. "How To Raise Sheep" is a complete ebook that will guide you on how to raise a healthy sheep and get the most profit you can from them even if your an absolute beginner. A lot of people think that raising sheep requires a lot of work and care. But that's not totally true. Raising your own sheep doesn't require that much work as you think it would. Sheep do well without any assistance since they are versatile creatures. If you are a beginner farmer who has a large grass land, you can have no problem in raising grass-feed sheep. You can grow you sheep in pasture all year round and reduce your expenses in buying feed. Reducing your cost will ensure that you make more profits in the long run. You can be thinking of raising sheep as pets, you maybe thinking of raising sheep because you want to help improve an agricultural landscape or you may want to raise for profit. What ever reason you may have to raising sheep you have to get the right guidelines in order to have healthy sheep. "This Is Not Just One Of Those Ebooks"
Me and my husband have talked about raising sheep for a few years now. When searching the internet we came across your ebook "How To Raise Sheep" and decided to take a look and see if we would get all the guidelines we would need. I must admit that I first thought this was one of those ebooks that will leave me in the dark not knowing what to do next. But I was wrong because is a complete ebook on raising sheep and your resources helped me in knowing what to do next. This is good and reliable information, from a good author. Every new sheep owner should get a copy of this guide before they venture in this project. This ebook will help you avoid the costly mistakes done by most beginner sheep farmers. "The First Must Read Sheep Ebook"
If someone reading your sales page wants to start raising sheep your guide is the first ebook they should read when wanting to raise sheep. Your guide has covered everything from raising baby sheep to housing my flock of sheep. Not forgetting how to reconnaise sheep diseases and treat them as well. This ebook also goes into detail with the enterprise and business side of sheep raising for those small and large farmers. I appreciate all the hard work you have done in putting this guide together. "A Dummies Guide To Sheep Farming"
As for dummies like me its a must that I get a clear guide if I want to start on any new project and your guide has been very useful to me. I have relatively little experience in building a sheep folk and your sheep ebook has opened my eyes to a new hobby of sheep farming. The images makes the learning curve more joyful. But above everything else it has given me the confidence to start in this hobby and has inspired me to become a shepherd. I'm happy I got guidance from your ebook. This guide won't leave you hanging not knowing what to do next. Its a step by step sheep farming plan that spells out your next step in plain English, you won't need to look for other information or join any other expensive sheep farming training course once you have this guide in your disposal. Sheep usually need nutritious food regularly to be healthy, happy and contended. A diet that is high in energy, low in fiber and supplemented with ample of protein is considered ideal and wholesome to ensure the upward and steady growth of sheep. Sheep can not be called a sheep unless it loves its food. Its feeding habits are characterized with rooting and pleading for more food and eating food with a great gusto and relish. However, in spite of your sheep being constantly obsessed with the idea of eating food, it does not mean you submit to its obsession. There is a specific and regulated pattern of feeding and eating habits for your sheep and before you give your sheep that extra morsel of food, ponder again! This is a must have guide for every farmer who wants to proper feed their sheep, its a complete ebook to healthy sheep farming that will ensure that you feed your sheep the right nutrients from a young age. When just beginning in raising sheep the first thing you have to prepare is land and housing. Raising sheep requires you to build a proper house for them. The housing provides the sheep with shade from the hot sun and keeps them warm in the winter. Sheep house can be designed using wire, fencing hardware and hay. And house should be well ventilated as well and be kept clean. Believe it or not but sheep are clean animals and don't like to defecate their own pens but that doesn't mean you can't help them out. With "Sheep Housing And Shelter" you’ll be amazed at how simple and easy it is to proper house your sheep. You will get all the different options to housing and the required equipment for sheep farming. "How To Raise Sheep" retails for $167. But today we are offering it to you for only $29.97. All of the information on raising healthy sheep is simple to understand with images to guide you. 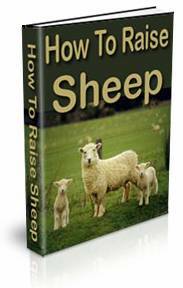 You'll never find a guide that guides to on raising sheep in one ebook. This guide eliminates the time you will spend searching for incomplete information about raising sheep. You don't have to purchase a guide on feeding sheep alone, then buy yet another guide on raising young sheep and keeping your sheep healthy separately, that will cost you over $100. Just by making a one time investment of $29.97 you will get all you need to know on raising sheep at a cost of the price. When getting into sheep farming you should get your production goals set before you buy your sheep. Will you be raising your sheep on pasture? How are you going to manage your sheep in the winter seasons? Are you going to pasture your lambs? You should also consider your costs for each traits. You should also consider the type of climate you want to raise your sheep and the ranch in which you are going to raise your sheep. What are the advantages and disadvantages? Knowing this will help you in planning ahead and reducing the chances of getting unexpected expenses. So if you are serious about becoming a successful sheep farmer, your first step is getting a copy of this guide. Once you get used to how sheep are managed you can be sure that you will produce high quality meat, milk plus wool and make a fortune from the sheep farming industry. "Knew Your Ebook Would Deliver"
Some friend of mine told me you had released a new ebook on raising sheep, I just had to get myself a copy! I have bought your other ebooks and they have helped me in raising 2 different types of livestock. Sheep farming will be the 3rd type of livestock to raise. Although I've raised different types of livestock before I'm brand new in raising sheep and knew your ebook will deliver all the gold information in raising sheep. The chapter about feeding sheep, in particular on the difference in ram, ewe and lamb was in very interesting read. I'm going to read through your guide once again so I can let the information sink in, I'll also have a look at your resources and see if I have any of your recommended supplies around my area. I think I'm ready to get started. For successful sheep farming, it is very important that you know what you are doing so to avoid failures. You have to know how to feed and give proper shelter for your sheep. You will have to know how to early notice and treat different types of health matters and diseases that will be of harm to your livestock. And when it come to sheep farming this is the only guide that covers every aspect of raising healthy sheep. It's a complete guide to being a productive sheep farmer. So if you want to raise healthy sheep, make sure you have this ebook for guidance and reference! P.S. A farmer should understand that not all sheep breeds are equal, so make sure before you buy your sheep that you are buying the right breed. Grass based setup is not good for prolific breeds, more attention is required for dairy sheep and hair breeds don't do well in extreme winter seasons. P.P.S. When starting out on raising sheep you should understand that shearing should be done after lambing, usually in late spring or early summer. If lambing time is late, the shearing may be done before the lambs arrive. Tie up the fleeces separately, first sorting out dung locks and tags. This ebook will give you all the guidelines to shearing as well. Yes, Gerard I Too Want To Raise Healthy Sheep! I understand that this ebook will help me start a successful sheep farm even if I'm an absolute beginner and haven't tried raising livestock before. How To Raise Sheep - Which will guide me on how to raise profitable sheep in my very own farm. I will discover how to care for them and profit from their produce. Sheep Feeding And Equipment - This is a complete ebook on how to proper feed my sheep and make sure they get enough nutrients to grow healthy and strong. Sheep Housing And Shelter - With this ebook I will get guidelines with dimensions on how to build and proper house my sheep making sure they are well protected. Get the one and only guide to successful sheep farming by adding this guide to your cart below and make a one-time Investment. You will then be redirected to the secure members area where you will get immediate access to download your "How To Raise Sheep" ebook plus the two bonus guides. Another copy will be sent to your e-mail inbox.